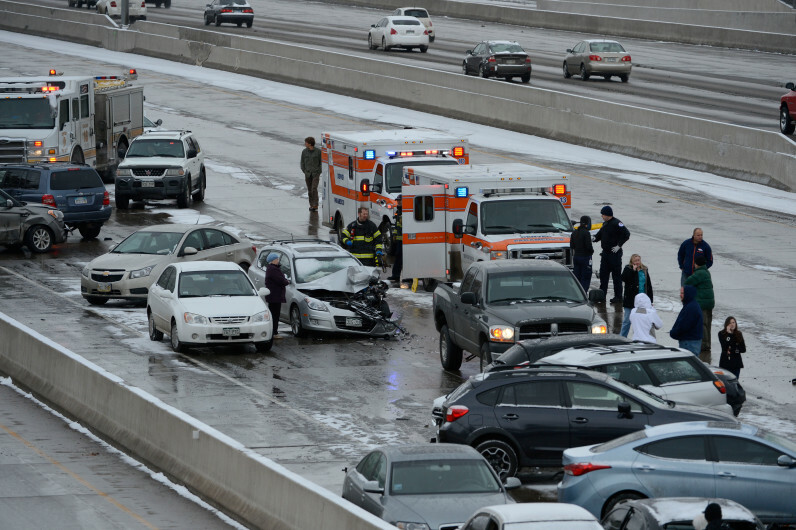 Denver Fire and Police clean up the scene of a multi-vehicle crash on north bound I-25 at Downing St. Saturday morning, March 1, 2014. The theory that Colorado drivers are some of the worst in the nation now has data to back it up. Insurer Nationwide said that it analyzed data from its SmartRide telematics program, which installs a small device in cars, tracks a user’s driving habits, including hard braking, fast acceleration and nighttime driving. Colorado drivers have a high frequency of suddenly speeding up – an indicator of dangerous behavior, said Larry Thursby, Nationwide’s vice president who oversees the telematics program. The most aggressive driving is on Thursdays, especially during the morning commute. On weekends, bad-driving habits peak on Sundays.